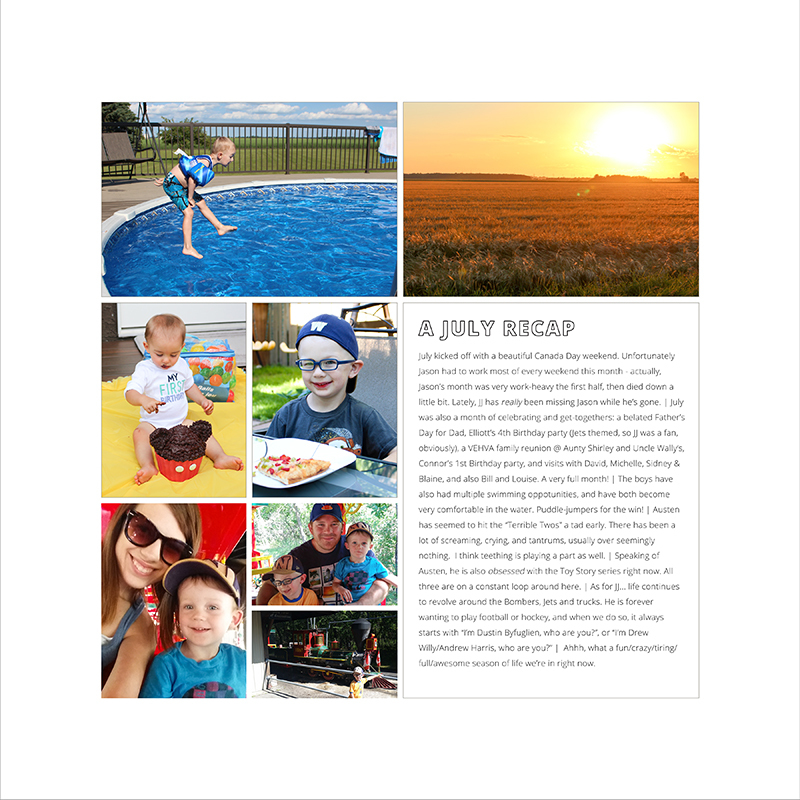 Nicole Mann: Project Life 2016 Update & July 2016 Pages! 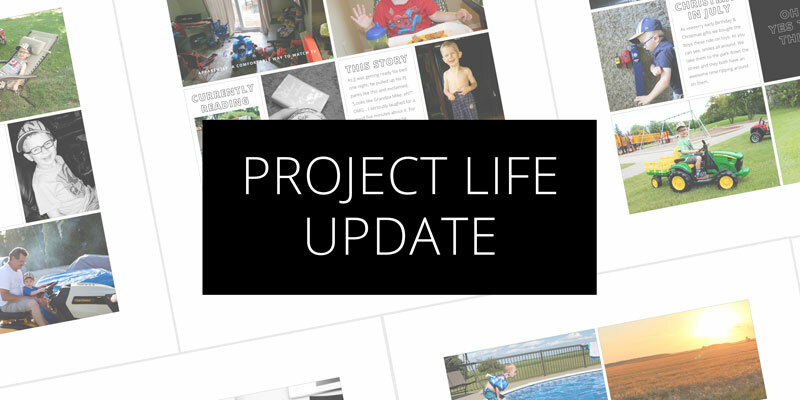 Project Life 2016 Update & July 2016 Pages! 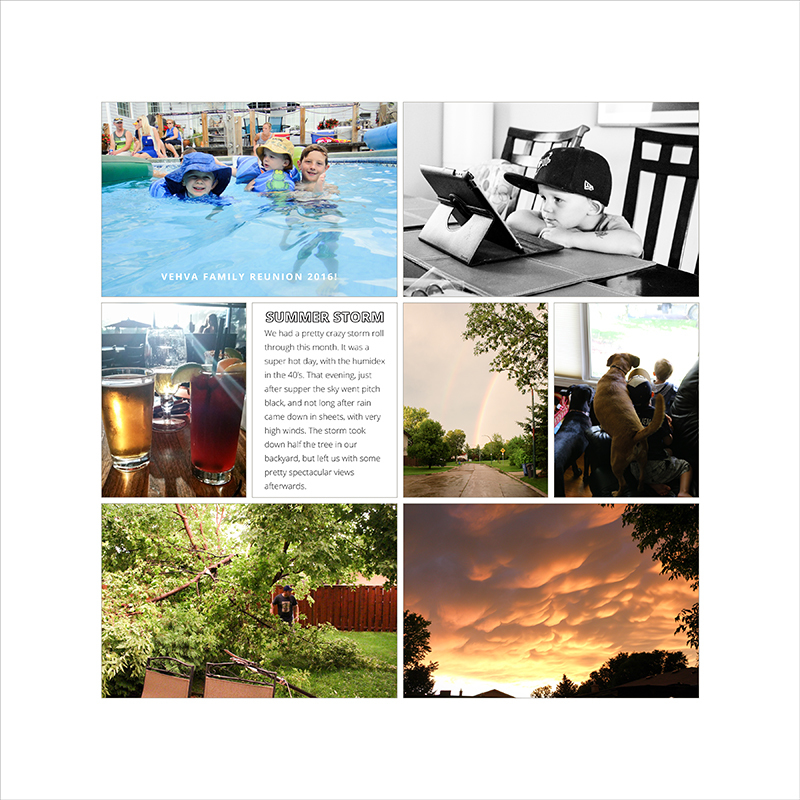 Well, as you've probably noticed, it's been a little quiet here lately on the Project Life front. After starting out fairly strong and consistent, I totally lost steam around the end of March, and haven't completed much for my album since then. In the past few weeks, I tried to get back on track, but I've just felt totally unmotivated. Which is funny, since I have been in a pretty good scrapbooking groove in terms of traditional pages. I took a look back through what I had accomplished in my album so far, and wasn't in love with it. I didn't hate it, but I didn't feel excited looking through it. It looked disjointed to me. There were a few spreads that I really loved, but as a whole I wasn't happy. At the same time, I knew I really wanted some kind of "2016" album - a look at our whole year. I have missed having that in the last few years, and it was one thing I really wanted to accomplish this year. Along with switching to digital, I'm switching my approach from weekly to monthly. 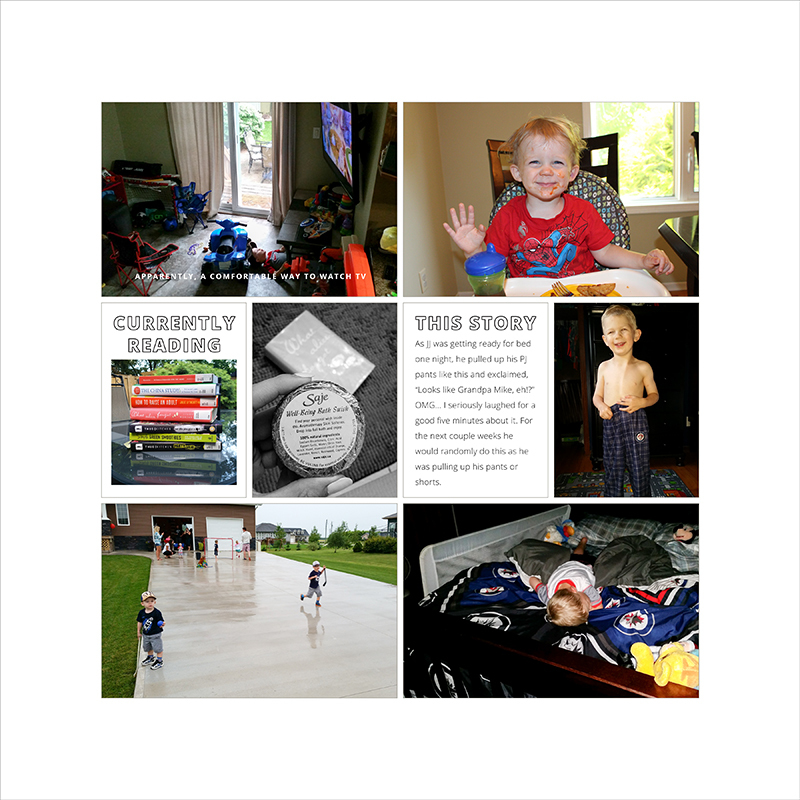 I actually signed up for Cathy Zielske's Scrapbook Your Year class once I decided to make the change to digital. (PS, if you are feeling overwhelmed with documenting the day to day, I highly recommend this class!) Her approach is to document the highlights of the month, and not worry about catching every little detail. Which I am fine with. 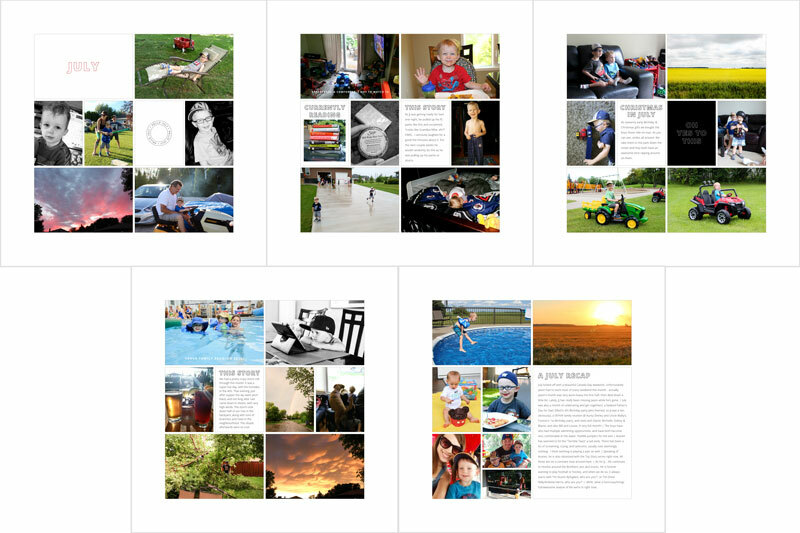 Now that I've gotten into the swing of creating more physical, traditional pages, I feel much better about my "Project Life" album being an overview, or highlights of our year. So far I've completed my pages for July, and I plan on working backwards. I'm not sure what I'm going to do about January through March of this year... since I already have those documented... I may just re-do them, but still save those few spreads that I really love. We'll see! Here's what my July pages look like! I'm not worrying about how many 'spreads' each month is going to be. I'm just picking out highlights, and whatever that works out to, it works out to! As you can see, it's all mostly pictures. A few short stories here and there, and then a monthly recap at the end. I came up with this just by looking through the pictures and telling what needed to be told, as well as thinking about anything of significance that happened that I didn't have a photo of. I was considering adding a few digital brushes to some photos, here and there, just because I have so many I figured, why not. But after it took me 5+ minutes of trying to look for a 'perfect' brush for just one photo I realized, I am already getting away from what this is supposed to be. Simple, and easy, and a highlight of our month. So no brushes. Just the basics. I'm happy with how this turned out. 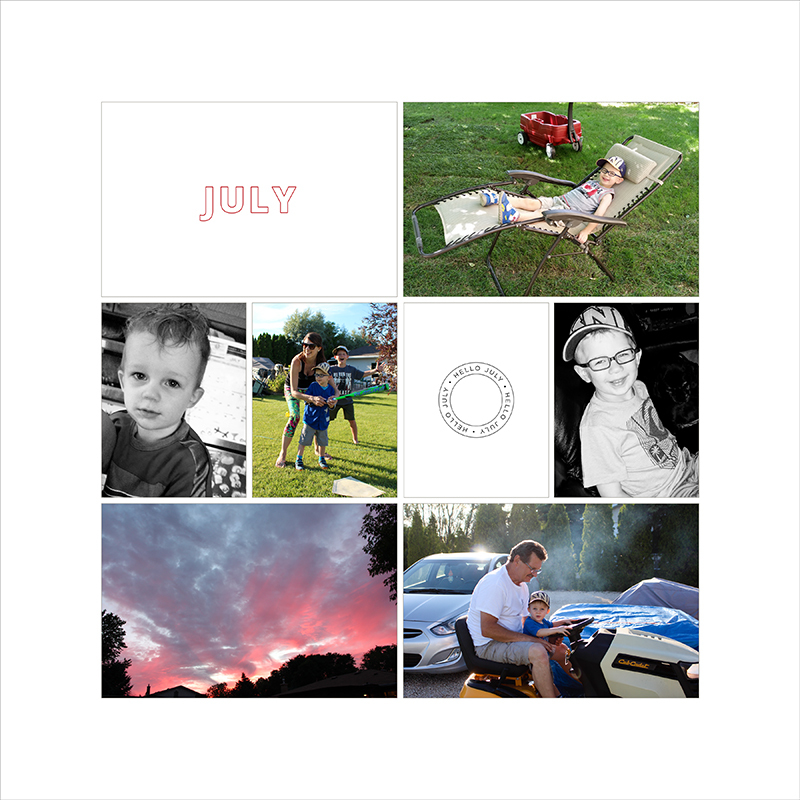 I had 500+ photos from July, and was still able to tell the story of 'our month' with 33 photos. This month was a full one, event-wise for use (a few birthday parties, a family reunion, family get-togethers, etc.) and I've decided that anything where I want to include multiple photos, or there is a bigger story, will just get its own layout. 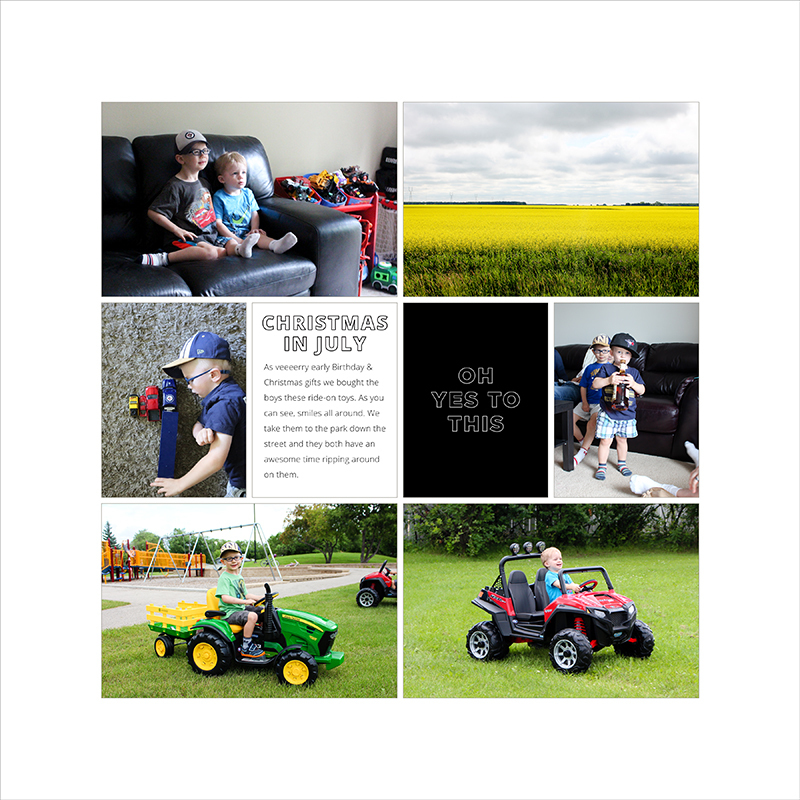 It may be as simple as just slipping some photos into pocket pages with a few journaling cards, or a full traditional layout, in all it's embellished glory. I'm also going to list those here, mostly as a way to keep track for myself, and to refer to when I am thinking of layouts to do. + JJ playing hockey - "I'm Byfuglien, who are you?" So that, in a very big nutshell, is my Project Life update. I'm going to continue to work backwards until at least April, so hopefully I will have those to share with you in the next little while. Thanks for stopping by today!